The garish image of Donald Trump’s face wrapped around a lip-shaped urinal in a Belushi’s sports bar is a symbol of Paris’ multicultural influence and modern artistic freedom. When visiting Paris for the first time most of us tend to think of traditional architecture, ranging from the Gothic towers of Notre-Dame to the Rennaissance wings of the Louvre, the Roman Catholic basilica of the Sacré-Coeur or even the high-tech panels of the Louis Vuitton Foundation. But Paris is increasingly becoming home to daring new artisic creations in places you’d least expect. In the men’s toilets of Belushi’s sports bar, a popular student, tourist and expat hangout in the 10th arrondissement just a few steps from the Gare du Nord, you’ll find a Rolling Stones-inspired row of bright-red, lip-shaped urinals, designed by Dutch Artist Meike van Schijndel. Last year, two Californian artists decided to take it one step further by superimposing the face of Presidential Republican candidate Donald Trump, whose fiercely fought election campaign against Democratic nominee, Hilary Clinton, had become a permanent source of worldwide media attention. Politics aside, we might ask ourselves what the presence of this urinal masterpiece in a Parisian sports bar, which has gone viral across social media and inspired similar creations across the world, tells us about Paris as a 21st-Century capital city? Are you working or studying in Paris or visiting the city for the first time? 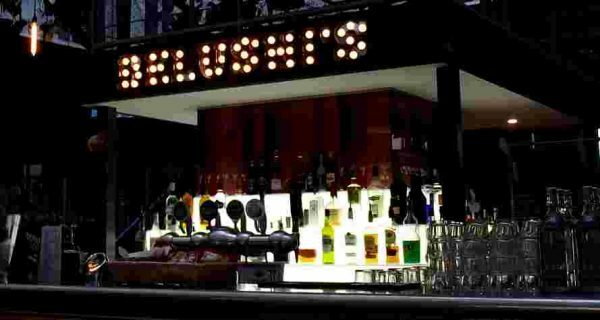 Why not visit Belushi’s, one of the most popular late-night bars in the 10th arrondissement?